Hootsuite is an old Social Media Posting animal. So whenever we talk about social automation, Hootsuite pops up almost inevitably. But is seniority enough to swing you toward using Hootsuite? Is the Features list good enough for your business? In this text, we will cover the key features, advantages, and disadvantages of using Hootsuite, one of the most used applications for managing multiple social media profiles from one place. Almost 8 million people are using the Hootsuite dashboard for different purposes and in this text, you can find out if Hootsuite works for you. If your main goal for using a social media dashboard is monitoring and engagement, Hootsuite can be a solid fit. Tracking, listening, and monitoring are the Hootsuite key features. Connecting with over 150 social sites (thanks to their massive App Directory) makes Hootsuite the king of connectivity. You have really too many alternatives to be active on the social media and overall, to engage your audience and to attract new clients. 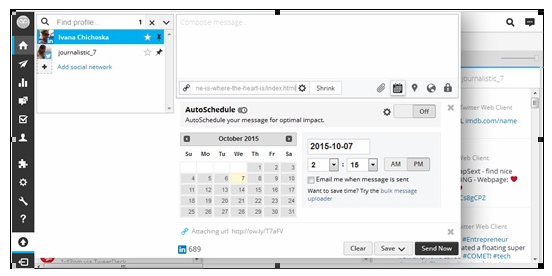 The Hootsuite Scheduler can be of a great help for posting different content on your social media profiles. The AutoSchedule feature sets up an optimal time for posting, depending of your timezone in order your posts to have more views, likes, retweets… Hootsuite AutoSchedule as a tool is a great helper in scaling your audience engagement. Whether you want to add a link, location, attach image or file to send it now or in a few days/ months/ years, just choose the date and which time you want Hootsuite to publish your social media update. And last, but not least, you can shrink long URLs before inserting them into a post using Ow.ly. The Hootsuite AutoScheduler sets only one time which is best for publishing your post, unlike Buffer’s optimal Timing Tool which has maximum 16 posting time periods in a day for greater social impact. 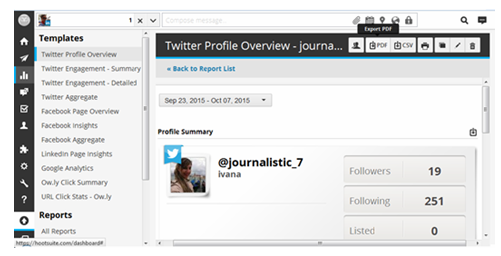 Also, Hootsuite lets you choose only one scheduling time for each social media profile. For comparison, Buffer has limits up to 25 time slots daily for Facebook, 700 time slots a day for Twitter and around 100 posting times for LinkedIn and Google +. With Hootsuite, you also can’t re-post some update for an indefinite time. The Buffer Extension gives you an option to choose if you want to publish the content now, in 8 hours, in a day, in 7 days or you can add another time. 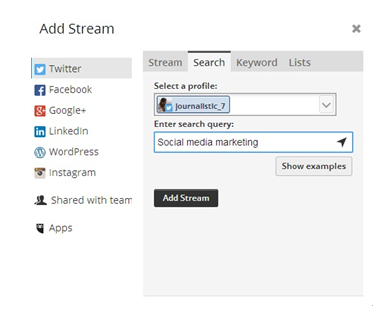 Hootsuite has a feature called Stream which shows your social media activity. Listening to what your clients say is not a problem compared to Buffer, which is completely communication-unfriendly. Hootsuite enables you to track, listen, monitor and measure engagement which makes it results-driven dashboard. 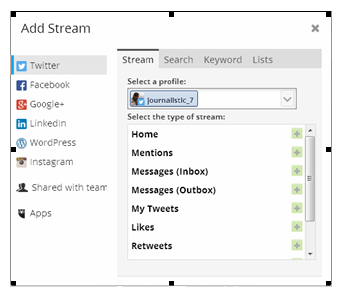 You can open up to 10 streams in each tab and see your Retweets, Mentions, Followers, Messages which is great for tracking how your audience is communicating and what keywords you need to target better with your content marketing efforts. In this way, you will listen to your clients and keep track of relevant news on different social channels. Therefore, you are one step closer to your clients and to optimizing your marketing activities. Hootsuite’s great at allowing you to engage your audience in conversations too. So other than posting on your social channels, you can also respond to any comments your audience sends your way. 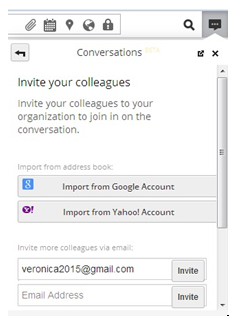 Hootsuite also allows you to invite your colleagues with importing contacts from your Google and Yahoo accounts via email. The conversation feature is excellent for coordination and managing activities between your team members right from the Hootsuite dashboard. You can have internal discussions for the workflows, working strategies and organizing the tasks. 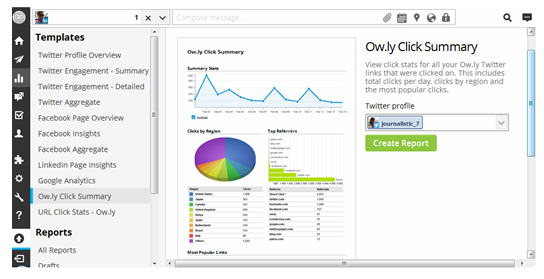 This makes Hootsuite a really sociable dashboard, practical, compact and adjustable. Hootsuite offers analytics, but only as a premium feature that you can purchase with “points”. With a Hootsuite Pro account you will have 50 points included with the cost of the Pro subscription, so you can run a report each month. When a report is deleted, the points will go back to your account, so you can use the points toward a different report. You have the option to add additional analytics points for $50/month, which will allow you more reports. In this way, you get extra 50 points which makes 100 points total and below you can see the „cost“ of each module. In terms of what he reports actually include, there are a number of different options. Analytics offers various reports for all types of plans (personal use, Pro and Enterprise). The reports will only start to generate data from the day they were created. Unfortunately, it is not able to pull information from previous months. If you keep the report open and do not delete it, you can set the date and refer back to the data collected say from the first day it was created, but nothing past that first creation date. Here is a screenshot of the Twitter Profile Overview. This template practically includes Profile Summary, Follower Growth, and Most Popular Ow.Ly links. As you can see, Analytics costs quickly add up, as Hootsuite offers a wide range of reporting templates. In a data-crazed world, the extra 50 points you purchase at $50/mo won’t get you far. So if you want to leverage all the templates Hootsuite offers (and you will be tempted to do so), keep in mind that the initial $9,99/mo fee will quickly swell tenfold. If not more. You will definitely extend your social media activity by installing Hootlet, the Hootsuite browser extension so that you will stay up to date with the latest news on social sites. Hootsuite has a wide range of applications in the App Directory. 150 apps are available which means Hootsuite offers awesome connectivity and has great platform integration. 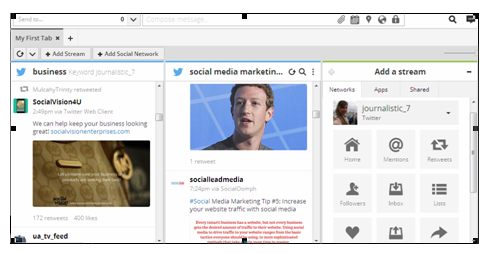 If you install the Hootlet extension on Google Chrome, you will quickly and easily share content to your social networks from anywhere on the web. 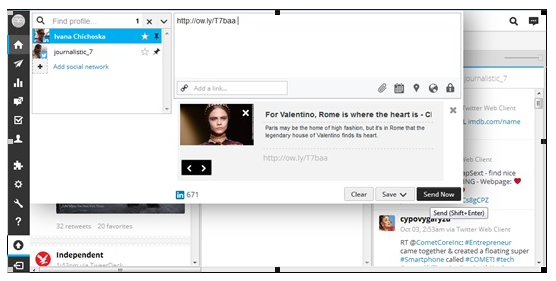 Hootlet is a free browser plugin that makes sharing different types of content pretty simple. 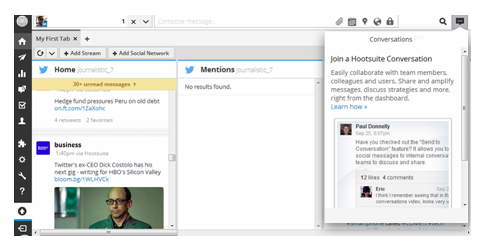 Here is a screenshot of the Hootsuite extension. As you can see, is it up to you to pick up a time whether you want to post your update now, later or to AutoSchedule (Hootsuite to set up an optimal engagement time). The Hootsuite App Directory is a massive collection of extensions and applications that business professionals can add to their Hootsuite dashboard. When you click on the App Directory you have all of the integration apps such as Youtube, Tumblr, Blogger, WordPress, Flickr, SoundCloud, Vimeo, App.net, MailChimp and many others. This is how the Tumblr app looks like when integrated into the Hootsuite dashboard. 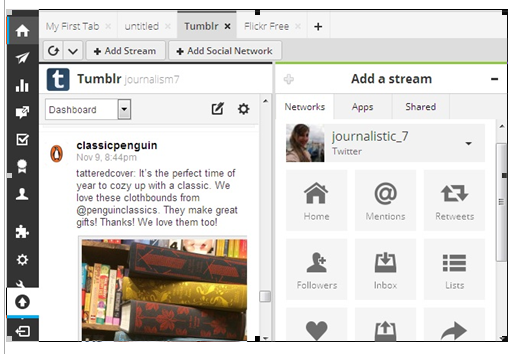 Hootsuite is definitely a leader in the platform integration with the 150+ apps available. This makes Hootsuite excellent in connectivity, tracking, listening, monitoring and engagement. Hootsuite Pro starts at $9,99 a month with a 30 days free trial included. For this price you are allowed to link with 50 social media profiles of yours, you can have 1 team member, advanced scheduling with 350 posts at a time, access to the complete App Directory and enhanced security. The fee seems quite low but with the limited Analytics you get, monthly expenses will easily jump to at least $109/mo if you only want Twitter and Facebook tracking on an ongoing basis. Chances are though, that you will also want (and need) Pinterest, Google, and Linkedin tracking, so for the average marketer who is serious about their social activity, the real monthly price of Hootsuite will add up to some $260/mo. Hootsuite engagement is pretty fancy. Since not every marketer can monetize social media engagement properly, Hootsuite can be a great tool for this challenge. 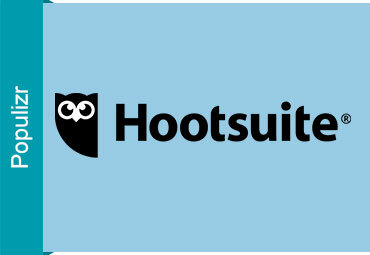 The Hootsuite key feature is connectivity and the biggest benefit is the engagement you get directly from the Hootsuite dashboard. This is a huge time-saver as you no longer need to keep a ton of opened tabs to keep track of all your social profiles. The Analytics feature is also a great asset. You do pay up for it, but you simply can’t run a successful social media marketing campaign without keeping your finger at the pulse of each of your social profiles. One of the most prominent down-sides is that Hootsuite has limited scheduling abilities. You can choose to send a social update now or select only one scheduled time for your post which means lower social automation compared to Buffer who has greater possibilities for posting (25-time slots daily for Facebook, 700 posting times a day for Twitter and around 100 for LinkedIn and Google +). The same is with the AutoSchedule feature – it gives you only one time period which is the optimal engagement time. This is quite different from Buffer’s Optimal Timing Tool that calculates for you the best time(s) according to your time zone and the number of times you want to re-post that content. With the 50 points included in your Pro subscription, you are not able to choose as many reports as you want. You can hopefully delete the report and then have a chance to pick another reporting template form a different type (module), but deleting the report is not the most rational or the best solution possible for that price. You still have the option to add analytics points for $50/month, but you are again limited because you get only 50 points extra which make 100 points total (have in mind that Analytics modules are different points: 0, 20, 30, 50). As we mentioned previously, a serious marketer will want to keep an eye on an ongoing basis on at least the 5 major sites: Facebook, Twitter, LinkedIn, Google+ and Pinterest. Only in analytics cost, you are looking at a fee of $250/mo. Summary: Is Hootsuite For You? As always, everything depends on what you really prefer and need for your social presence. Obviously, there is no such thing as an ideal dashboard (yet) and Hootsuite may be quite a long way from being ideal for you too. Hootsuite is great in terms of connectivity. 150+ apps in the App Directory really make Hootsuite the king of social connectivity. It’s great that you get to engage your audience in conversation directly from the Hootsuite dashboard, which is a tremendous time-saver. Not to mention freedom from all that browser-clutter you’d experience on a daily basis if you’d have to manually keep an eye on all your social channels. The greatest shortcoming of Hootsuite is that you only get to track a single social channel with your Pro account. That’s not nearly enough for a serious marketer, so people will be left hungry for more data… or pay up for all the other needed tracking deals that Hootsuite offers. It seems that while Hootsuite is a great connector and engager, it’s not overly data-friendly. So the search for the perfect social automation platform continues.